The Eurasian tree sparrow was the most notable target of the campaign. The Four Pests Campaign (Chinese: 除四害), was one of the first actions taken in the Great Leap Forward in China from 1958 to 1962. The four pests to be eliminated were rats, flies, mosquitoes, and sparrows. The extermination of sparrows is also known as Great Sparrow Campaign (Chinese: 打麻雀运动; pinyin: Dǎ Máquè Yùndòng) or Kill Sparrows Campaign (Chinese: 消灭麻雀运动; pinyin: Xiāomiè Máquè Yùndòng), which resulted in severe ecological imbalance, being one of the causes of the Great Chinese Famine. In 1960, Mao ended the campaign against sparrows and redirected the fourth focus to bed bugs. 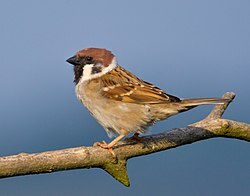 The "Four Pests" campaign was introduced in 1958 by Mao Zedong, as a hygiene campaign aimed to eradicate the pests responsible for the transmission of pestilence and disease: the mosquitos responsible for malaria; the rodents that spread the plague; the pervasive airborne flies; and the sparrows – specifically the Eurasian tree sparrow – which ate grain seed and fruit. The government also declared that "birds are public animals of capitalism". As a result of this campaign, many sparrows died from exhaustion; citizens would bang pots and pans so that sparrows would not have the chance to rest on tree branches and would fall dead from the sky. Sparrow nests were also destroyed, eggs were broken, and chicks were killed. In addition to these tactics, citizens also resorted to simply shooting the birds down from the sky. These mass attacks depleted the sparrow population, pushing it to near extinction. Furthermore, contests were held among enterprises, government agencies, and schools in cleanliness. Non-material rewards were given to those who handed in the largest number of rat tails, dead flies and mosquitoes, or dead sparrows. At dawn one day last week, the slaughter of the sparrows in Peking began, continuing a campaign that has been going on in the countryside for months. The objection to the sparrows is that, like the rest of China's inhabitants, they are hungry. They are accused of pecking away at supplies in warehouses and in paddyfields at an officially estimated rate of four pounds of grain per sparrow per year. And so divisions of soldiers deployed through Peking streets, their footfalls muffled by rubber-soled sneakers. Students and civil servants in high-collared tunics, and schoolchildren carrying pots and pans, ladles and spoons, quietly took up their stations. The total force, according to Radio Peking, numbered 3,000,000. Some sparrows found refuge in the extraterritorial premises of various diplomatic missions in China. The personnel of the Polish embassy in Beijing denied the Chinese request of entering the premises of the embassy to scare away the sparrows who were hiding there and as a result the embassy was surrounded by people with drums. After two days of constant drumming, the Poles had to use shovels to clear the embassy of dead sparrows. On June 19, 1998, a poster was spotted at Southwest Agricultural University in Chongqing, "Get rid of the Four Pests". Ninety-five percent of households were ordered to get rid of four pests. This time, sparrows were replaced with cockroaches. A similar campaign was spotted in the spring of 1998 in Beijing. Few people responded to these campaigns, as many already had the habit of killing the aforementioned pests, especially cockroaches. In the TVB drama series Rosy Business (aired 2009 but set in mid-19th century China), a peasant came up with the idea of killing the sparrows to improve agricultural output. It was meant to be a prank used to trick the peasant owners into starvation and poverty. In Episode 20 of the children's animated television series Sagwa, the Chinese Siamese Cat (aired 2001–2002 but set in China around 1900), the mistress of the house declares that certain useless animals are banned from the compound. After the animals – the episode's eponymous birds, bees, and silkworms – are driven out, the family discovers the consequences. The mistress' fancy banquet is ruined by the lack of food and clothing, and she learns a valuable lesson. The album Every Red Heart Shines Toward the Red Sun (2006) by the American post-rock band Red Sparowes tells, by way of its song titles, the story of the Great Sparrow Campaign. The children's book Sparrow Girl (2009) by Sara Pennypacker tells the story of the Sparrow War. ^ "Paved With Good Intentions: Mao Tse-Tung's "Four Pests" Disaster – Body Horrors". Body Horrors. 2014-02-26. Retrieved 2017-04-25. ^ a b Nowak, Eugeniusz (2002). "Erinnerungen an Ornithologen, die ich kannte (4. Teil)" (PDF). Der Ornithologische Beobachter (in German). 99: 49–70. ^ a b "Eliminate the Four Pests (1958)". chineseposters.net. Retrieved 2017-04-25. ^ a b Dvorsky, George. "China's Worst Self-Inflicted Environmental Disaster: The Campaign to Wipe Out the Common Sparrow". io9. Archived from the original on 2012-08-22. Retrieved 2017-04-25. ^ "Eliminate the Four Pests (1958)". chineseposters.net. Retrieved 2017-04-25. ^ "Red China: Death to Sparrows". Time. 1958-05-05. ISSN 0040-781X. Retrieved 2017-04-25. ^ "Chiny. Historia" [China. History] (in Polish). 2 June 1999. Retrieved 3 May 2016. ^ a b c Shapiro, Judith Rae (2001). Mao's War Against Nature: Politics and the Environment in Revolutionary China. Cambridge University Press. ISBN 0-521-78680-0. ^ a b McCarthy, Michael (2 August 2006). "The secret life of sparrows". The Independent. Retrieved 30 January 2009. ^ a b Summers-Smith, J. Denis (1992). In Search of Sparrows. London: Poyser. pp. 122–124. ISBN 0-85661-073-9. ^ Peng, Xizhe (1987). "Demographic Consequences of the Great Leap Forward in China's Provinces". Population and Development Review. 13 (4): 639–670. doi:10.2307/1973026. JSTOR 1973026. ^ Akbar, Arifa (17 September 2010). "Mao's Great Leap Forward 'killed 45 million in four years'". The Independent. PBS series "The Peoples' Century – 1949: The Great Leap"